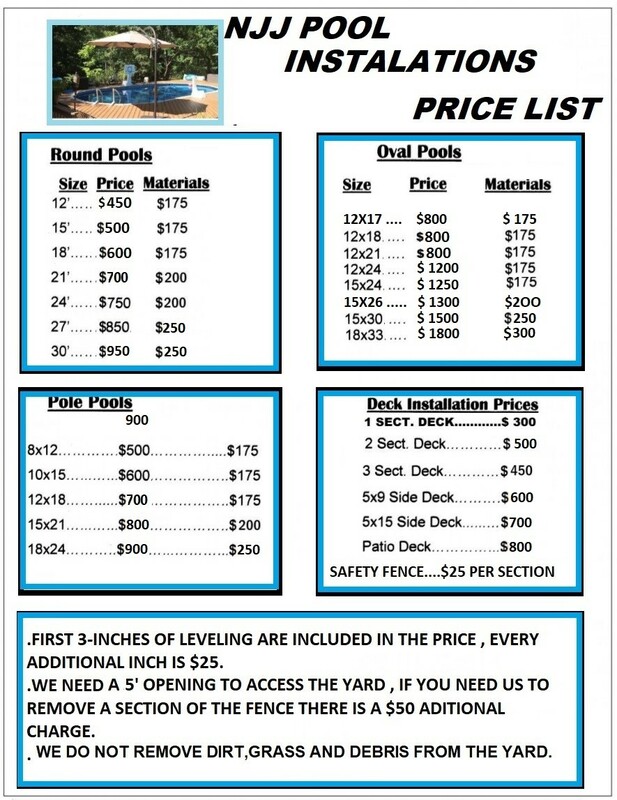 CALL NJJ TODAY TO FIND OUT ABOUT OUR SEMI-INGROUND POOLS! NEED SUPPLIES? YOU'RE IN LUCK - WE'RE PASSING OUR INDUSTRY PRICING OVER TO YOU! We sell and deliver gravel, mulch, sand, hardscaping supplies, and much more! Was perfection at its best. The process was run smoothly from start to finish. Peppa, the office administrator, returned calls promptly whether for scheduling or installation questions. Nick and Greg arrived timely then efficiently and effectively removed our old pool to install the new one in the utmost meticulous manner. They are experts in this pool phase and their perfect gentlemenly personalities was also a plus. Upon completion their clean-up was second to none. They left us without a worry in sight. If there is anyone who needs a pool installed we hold NJJ POOL INSTALLATION in high regard and recommend them for your pool needs. We use the latest pool installation equipment. We travel up to 40 miles outside of the Linden & Woodbridge, NJ area to install or repair your pool. Our employees are friendly, knowledgeable, experienced and detail-oriented. We maintain a drug-free work environment. We have a flexible appointment schedule. Our rates are among the lowest in the area. Whatever your above-ground pool needs are, our team will take care of them quickly so you and your family can enjoy your pool as soon as possible. Ready to splash into savings? Call 908-494-9934 to find out about our above-ground swimming pool rates in Linden & Woodbridge Township, NJ. Our team will complete any job you have exactly the way you want. Once we’ve serviced your pool, you can enjoy a glass of your favorite drink poolside as your little ones have fun in the sun. Call today to schedule your above-ground pool installation or repair in Linden & Woodbridge Township, NJ or the surrounding areas. NJJ Pool Installations is a locally owned and operated swimming pool contractor. For over 25 years, we’ve constructed and maintained beautiful above-ground pools for Linden & Woodbridge Township, NJ area residents. We have two reliable, dedicated crews who are ready to tackle your toughest pool installation or repair job. Count on us for outstanding exceptional results. Contact our office in Linden & Woodbridge Township, NJ for more information about our above-ground pool services.